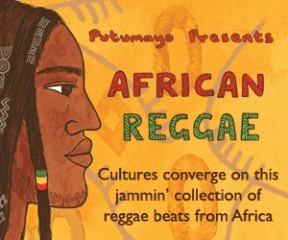 On January 27th, Putumayo World Music will release African Reggae. This collection is, in part, an homage to Bob Marley’s powerful impact on African music, as February 6th will mark his 64th birthday. African Reggae features selections by outstanding African musicians who have built upon Jamaica’s ‘golden age of reggae’ in the 1960s and 1970s by weaving together traditional and modern sounds into a vibrant musical fabric. When reggae evolved from ska after Jamaica’s independence in 1963, it quickly dropped its seeds in Africa, the true land of its origin. Pioneering Jamaican artists Desmond Dekker and Jimmy Cliff were African favorites in the 1960s, followed in the next decade by Bob Marley, whose songs of African unity and liberation and concerts in Africa inspired all of the artists on this CD. the mystical kora-laced incantations of Guinea Bissau’s Nino Galissa. Africa and how African musicians have added their own unique flavors to create an exciting, fresh musical brew. the music on its CDs originates.